As a luxury boutique hotel in Windermere, we have put a lot of thought into the monochromatic schemes of our eight suites ­– believing that the right scheme contributes to the overall feel of absolute luxury. Expect lavishness and extravagance in each suite. Each suite is unique with its own individual palette and style – no two suites are the same, but they have all been cleverly designed to complement one another. From the silvers and greys of the Ambleside and Bowness suites, to the white and pearlescent finishes in the Grasmere suite – we have created the perfect monochromatic interior design. Think clever, modern and luxurious with a twist of metallics, pearlescence and texture. Our walnut flooring creates a real sense of opulence alongside the bold, floral fabrics in dark and sumptuous colourways, as well as wallpapers in a variety of patterns from Tektura. We’ve made sure that the colour scheme of everything at Windermere Suites screams contemporary luxury. Based in the heart of the Windermere, step into Windermere Suites and experience a pleasing contrast from the blue and green tones of the Lake District with our seductive monochromatic interior. If you fancy stepping into a world of contemporary luxury, then Windermere Suites is most definitely for you. Not sure what a stay at a luxury hotel in Windermere is really like? Why don’t you come and see for yourself? Book a stay in one of luxury suites and experience our wonderful sumptuous colour schemes amongst many other things designed to impress! One of things we love about luxury break in Windermere, is its prime location to explore the stunning Lake District scenery. It goes without saying that one of the best things the Lake District has to offer is, of course, its Lakes! Even if you don’t consider yourself to be a big walker or you’re not a massive fan of the outdoors –there are still plenty of short, easy walks that will reward you with breath-taking views. Our personal favourite at the Suites is the beautiful Tarn Hows, but don’t just take our word for it – Jet (our very friendly receptionist) absolutely loves it! This walk is suitable for everyone and has some unbeatable views of the Langdale Pikes. There’s no doubt you’ll be able to get that picture-perfect shot, and if you time it well, you might even catch a stunning sundowner for a magically romantic moment. Head to the National Trust car park at Tarn Hows to begin your walk. The route itself is well-prepared with obvious gravel paths, so you won’t struggle finding your way. The short route takes around 1 hour, so it’s nothing too strenuous at all, but gives you the perfect opportunity to experience the Lake District at its finest. For an even better view, we recommend taking the ferry across the Lake to truly soak up all its beauty! What’s even better is that when you’re staying at our luxury hotel in Windermere, you know you have a wonderfully comfy Suite waiting for you upon your return! Why not treat yourself to a luxurious bubble bath, followed by cosy bath robes and a well-deserved gin and tonic as your post-walk relaxation? It doesn’t get much better than that! If you fancy staying in the heart of the Lake District with our luxury hotel in Windermere just a stone’s throw away from the spectacular scenery, then book a stay in one of our suites and explore the Lakes at its finest! If you’re looking for a night of live music, great food and even greater cocktails during a stay at our boutique hotel – we know just the place. Baha Bowness is the Lake District’s newest super venue, with three floors of food, drink and music. It’s the place to be for a night of fun and excitement in Windermere! With a tasting house on the first floor and a lounge bar and grill, you’ll be spoiled for choice at the impressive choice of food on offer. Choose to enjoy a mixture of delicious dishes in a relaxed atmosphere featuring small plates, sharing boards, a grill menu and more. One of our favourite things about Baha, and why we think it should be on your list of places to visit during a stay with us – the amazing drinks! Baha have such a wonderful selection of alcoholic and non-alcoholic drinks from all over the globe, there is no doubt there will be something to suit your taste. Their expert mixologists will create you something you love in no time! Whether you’re in the mood for a fancy cocktail, a glass of bubbly, a draught beer, or a classic gin and tonic – Baha has it all! Only a 15-minute walk from the Suites (or a 5-minute taxi if that’s what you’d prefer! ), Baha is so easy to get to. Our boutique hotel in Windermere is in the perfect location for a night out then crawling back into snuggly duvets for a wonderful night’s sleep. Baha has received so much great feedback on TripAdvisor since its opening a few months ago and we completely agree – it’s a fantastic place! Feel free to ask us for recommendations during your stay with us – one of the things we love about being a boutique hotel in the Lakes is the fantastic choice of places for our guests to eat and drink, and we’d be more than happy to share these with you! Windermere Suites is all about sumptuous, opulence and get-away-from-it-all style. 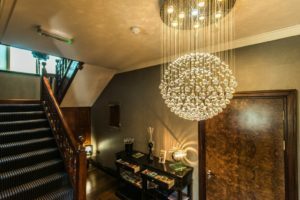 As a boutique hotel in Windermere, we pride ourselves on our lavish hotel styling – we aim to wow you as soon as you walk through the door! Want to discover our secrets to achieving this luxurious boutique hotel styling? We put a lot of thought into every piece of furniture, every pattern of wallpaper, every LED light installation and every picture on display – everything has been designed to impress and amaze. The styling at Windermere Suites allows you to step out of everyday life and into pure luxury. Windermere Suites is double fronted with eight suites, a large reception room and a hallway featuring original panelling from the 20th century. As one of Windermere’s top boutique hotels, we are proud of our collection of luxurious suites – three of which have patios, two have private entrances, and all of them share the same stunning interior décor, huge air baths and baroque-style beds with sumptuous bedding. You won’t find anything else quite like it! We believe in making a good first impression – we’ve designed Windermere Suites so that your immediate impression upon entering the hotel is one of contemporary luxe. Our stunning pendant crystal drop chandelier in the hallway reveals just this! These chandeliers are available from a trade only company as they truly are huge, but if you want to get your hands on a smaller version to wow your own visitors – ACHICA recently had a sale on designer lighting where a similar version features. Romance is at the very heart of everything we do and we have purposely created Windermere Suites to be the idyllic destination for a romantic getaway. From the designer beds, to the double air-baths – our boutique hotel styling revolves around love and passion, with romance being what we do best. Don’t just take our word for it – come and see for yourself the opulent stylings on offer at Windermere Suites! Book a stay in one of luxury suites and experience unbeatable boutique hotel styling. One of the many great things about Windermere is its fantastic selection of bars and restaurants. At Windermere Suites, we take pleasure in discovering the best of the best to recommend to the guests of our boutique hotel – even if this means having to go for a three-course meal every now and then! We recently visited Francine’s Coffee House & Restaurant – a lovely little bistro-style restaurant just a two-minute walk from the Suites. Francine’s is a long-standing favourite bistro in the village, and we can definitely understand why. I couldn’t resist the pan seared scallops served with homemade black pudding, pommes puree, chicken veloute sauce and basil oil – and I wasn’t disappointed. This, followed by the Francine’s seafood casserole from the ever-changing specials board, and I was in seafood heaven! Even though we were very full after our main courses – in the interest of sharing with you how lovely the desserts were too, we sacrificed our waistlines. Francine’s chocolate and almond sachertote was to die for, and I couldn’t get enough of my vanilla crème brulee. If only the photos we took were scratch-and-sniff pictures because our mouths were watering before we started eating – it looks like you’ll just have to try Francine’s out for yourself! With an a-la-carte menu and a daily specials board, Francine’s have a wonderful selection of food to suit everyone’s appetite. Seafood is their passion, and I can highly recommend trying some of the delicious, fresh seafood dishes on offer. You can even pop into Francine’s during the day for a coffee or tea and a bite to eat from their selection of homemade cakes, biscuits, scones or extensive lunchtime menu. With hundreds of other fantastic reviews on Facebook and TripAdvisor – we recommend making Francine’s your next dining spot in the Lake District. At Windermere Suites, we believe that the bathrooms are just as important as the bedrooms (if not more!) – which is why we go above and beyond with the design of our bathrooms. They ensure that our hotel in Windermere is the perfect romantic getaway for you and your loved one. Our bathrooms are designed specifically for deep, relaxing baths for two and the most romantic, soothing lighting you could possibly imagine. With oversized double air baths in each of the suites, you can expect to have the perfect luxury bubble bath during a stay with us – just let us know, and we’ll provide the fizz! All of our bathrooms have been designed to impress. With waterproof TVs built into Italian designer glass tiles, you can get ready for the most tranquil night in for two. Each bathroom has underfloor heating, showers with LED showerheads and LED taps – making them the most pleasurable place you will want to spend your time. Imagine a relaxing bath in the most amazing lighting – Windermere Suites has it all. Our chromotherapy mood ambience lighting in each bathroom really sets the tone and can be altered to suit any mood. The unique, ambient lights will help you relax and re-energise. At Windermere Suites, we understand that the bathrooms are just as important as the bedrooms if you are seeking a touch of luxury and spoiling. We add all the extra finishing touches at our luxury hotel in Windermere – indulgent White Company toiletries, fluffy bath robes and soft towels, so you can be sure to pamper yourself to your heart’s desire. If you fancy a bubble bath in the most romantic and relaxing surroundings ­– Windermere Suites is most definitely for you. Not sure what a stay at a luxury hotel in Windermere is really like? Why don’t you come and see for yourself? Book a stay in one of luxury suites and experience a bubble bath like none other!